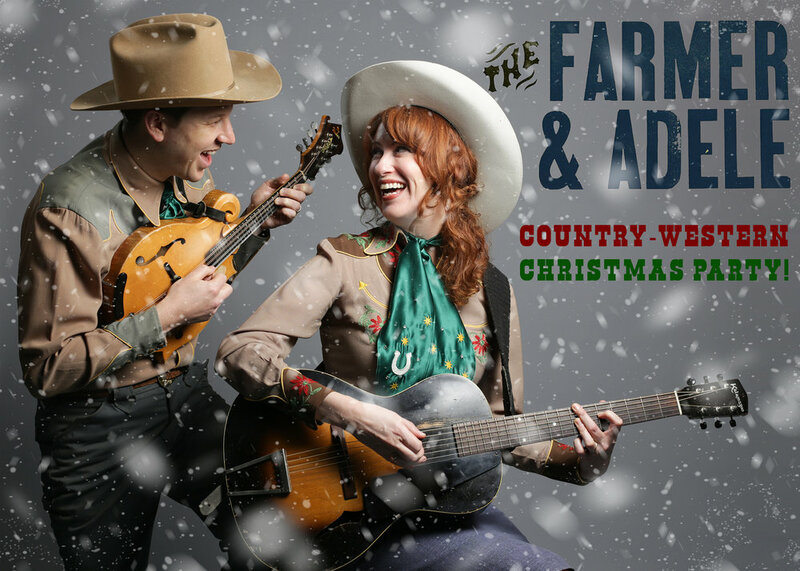 The Farmer & Adele "Country - Western Christmas Party"
The Farmer & Adele are on tour for their annual Country and Western Christmas Party show, featuring classic Christmas tunes, original holiday songs with a western swing twist! With the sounds of classic songwriting in their music and the future in their sights, The Farmer & Adele are reimagining the modern cowboy/cowgirl while respecting its beginnings. Based out of Nashville, TN, The Farmer & Adele – led by Grace Adele and Keenan Wade – leads the pack of a new wave of musicians revitalizing western swing music. With a star-studded record, award nominations and their own morning radio show, The Farmer & Adele are a one-two punch of classic meets modern. The Farmer & Adele have also quickly rooted themselves into the fabric of music communities near and far. The band’s debut effort, Into the Wide Open Sky, was selected to be featured as part of Nashville Public Library’s Boombox series, a closely curated music collection highlighting the best artists in Nashville. Most recently, the band was nominated by the Ameripolitan Music Awards for Best Western Swing Group.